We have been contacted by the Autonomous Student Network. They are keen to talk with student groups in Glasgow that would be interested in working with others using anarchist principals. If your group is interested being part of the network then their call-out and contact details can be found here. Students at glasgows Strathclyde University have occupied part of the administration building at their university. They demand,amongst other things, that the university disinvest in companies that profit from Israeli aggression and occupation of Palestinian land and that the university funds scholarships for Palestinians who have had their universities destroyed in the horror of December/January. This is an inspiring move from a student population who have been all too apathetic and self involved in recent years. 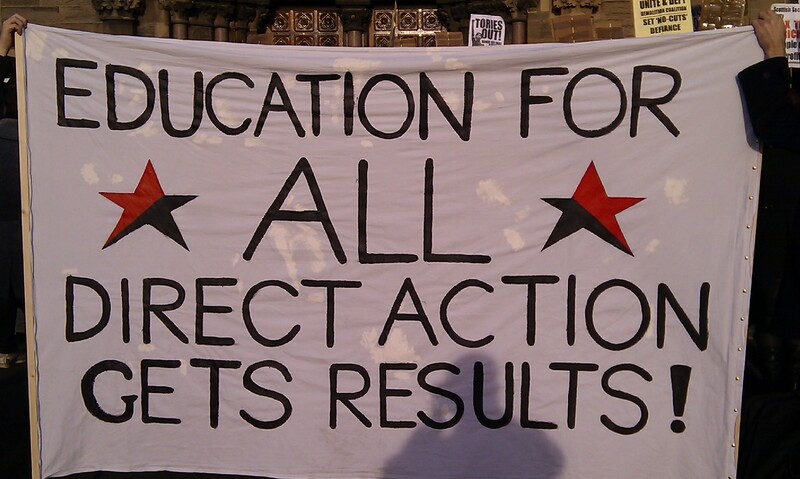 The students all over the UK who have occupied their places of education deserve our support and our applause for taking a stand. There will be a demonstration in solidarity with the students outside the occupied building at 11:00 am today. Enter your email address to subscribe to the blog and get notifications of new posts in your inbox.